Why did Charles Dickens have a personal postbox? In the 19th Century, when the postal service was in its infancy, Charles Dickens lobbied for his own personal letterbox, writes Kathryn Westcott. 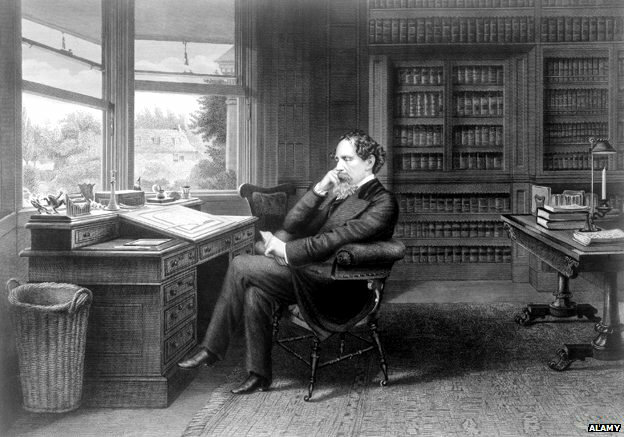 It’s Christmas 1869 and Charles Dickens, prolific letter writer, is hurriedly finishing off a correspondence. “The postman is waiting at the gate to tramp through the snow to Rochester and is unlawfully drinking a glass of gin while I write this,” Dickens reveals to his friend Charles Kent. The postman was a familiar sight at Dickens’s Georgian home, Gad’s Hill Place in Higham, Kent. A postbox, installed by the postal service at the author’s request, was one of the earliest wall-boxes to be introduced in Britain, following the introduction of the pillar box across the nation by fellow writer Anthony Trollope in 1852. Dickens had personally lobbied for that postbox in 1859. Continue article via BBC News – Why did Charles Dickens have a personal postbox? This entry was posted in PRINT, WORDS & BOOKS and tagged united kingdom. Bookmark the permalink. ← The Happy Rizzi House. I just love the “word speak” writers of yore put to paper – that last paragraph is a doozy!